The Theropoda (meaning "beast-footed") dinosaurs were a suborder of the the Saurischian dinosaurs. Dinosaurs in the Theropod suborder include, among others, Allosaurus, Spinosaurus, and Tyrannosaurus rex. Theropods first appeared during the Triassic period, about 230 million years ago, and gradually diverged into many different lineages. At some time during the Jurassic period, or perhaps earlier, one of the lineages gave rise to the first first birds. Theropod dinosaurs survived until the end of the Cretaceous period, about 65 million years ago, when all the remaining non-avian dinosaurs became extinct, although of course birds (which technically are a type of Theropod dinosaur) survive to the present day. Theropod dinosaurs were bipedal (walked on two legs). Their forelimbs generally had a highly restricted range of motion, for example they could not rotate ("pronate") their forearms so that their palms faced backwards or towards the ground. 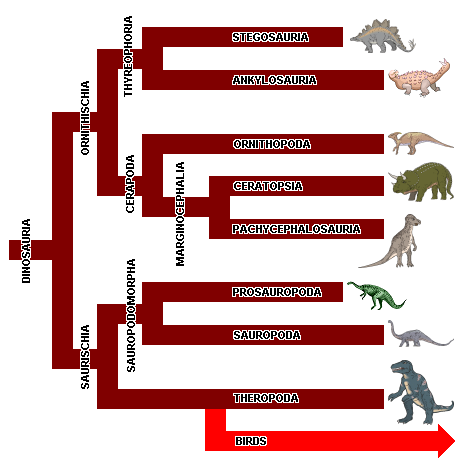 The vast majority of theropods were carnivores (meat-eaters), although a number of herbivorous (plant-eating) species did evolve towards during Cretaceous period (see, for example, Alxasaurus).